Lately, I’ve been lusting over the idea of grain-based salads. Summer is over and we find ourselves cuddled up in blankets, rather than basking in the sun. Light leafy greens just don’t seem to cut it. 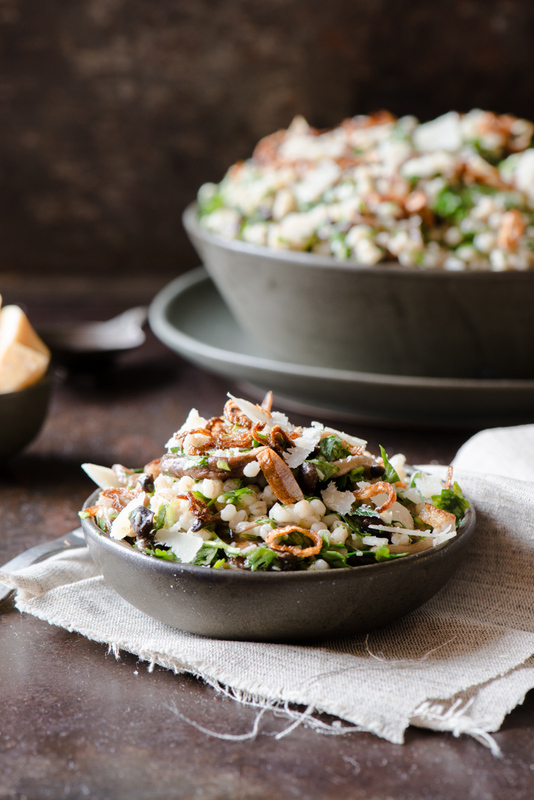 Inspired by this beautiful salad from Bon Appetit, along with a shameful bag of pearl barley, that’s been sitting in a cupboard for at least 5 years (embarrassing, I know), Shan and I picked up some groceries, and put this on our to-do list. Butter-basted mushrooms, fried shallots, and plenty of cheese make this salad super delicious, but definitely not the healthiest. That being said, with a few substitutions, and some different cooking techniques, it could easily be lightened up. Of course, we had zero complaints with the salad’s current state. It was a wonderful balance between fresh and hearty, thanks to a bundle of herbs and a lemony vinaigrette, offsetting the buttery mushrooms, and fried shallots. Even better, was the next day’s leftover salad. We treated it like fried rice. Tossing it in a pan to crisp it, before making a little hollow in the middle of the pan, adding a touch of butter, frying an egg and mixing it in with the salad. It was fantastic. This salad is kind of like fall. A transition between summer and winter, cool and warm notes, preparing us for winter. 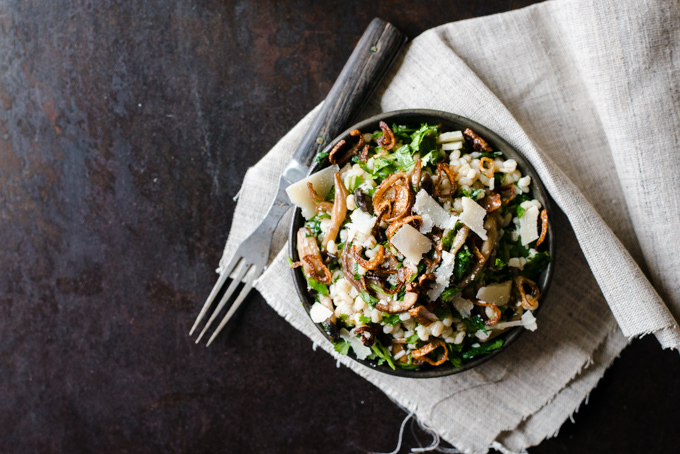 Bundles of fresh herbs, a lemony vinaigrette, mixed with buttery mushrooms, fried shallots, and a generous grating of parmesan make this barley salad a delicious blend light of and hearty flavours. In a small pot, add 1 cup of uncooked pearl barley to 2.5 cups of water, bring to a boil, then reduce heat to a light simmer, cover with lid and cook for about 45 minutes until water is absorbed. In a strainer, rinse cooked barley under cold water, removing any excess starches. While barley is cooking, fry shallots in a pan, with a ⅓ cup of vegetable oil on medium-high heat, stirring occasionally. Once golden brown, transfer shallots to paper towel with a slotted spoon, season with a pinch of salt, and let cool. Drain shallot cooking oil into a small dish for later use. In a large skillet, heat olive oil to medium-high heat. Add mushrooms to the skillet, making sure they are evenly spaced and not overcrowding the pan. Allow them to cook about 3 minutes, before stirring, until the underside becomes golden brown. Season with salt & pepper, and continue cooking about 5 minutes, stirring regularly until golden brown all over. If the pan is too hot while cooking mushrooms, reduce the heat. Reduce heat to medium, and add thyme, garlic, and butter to the skillet. Once the butter has melted, tilt the pan, so that the butter pools at the bottom edge. Using a spoon, baste the mushrooms, until butter becomes lightly browned and nutty smelly. With a slotted spoon, transfer mushrooms to a small bowl, discarding the thyme and garlic. 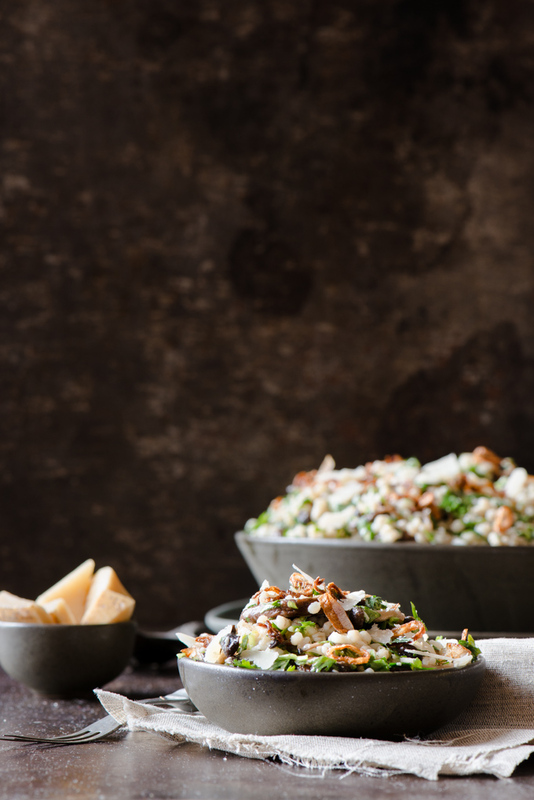 In a large bowl, combine barley, cilantro, parsley, lemon juice, parmesan, and 2 tablespooons of the reserved shallot cooking oil. Toss to coat. Season to taste with salt & pepper, then add mushrooms, tossing until combined. 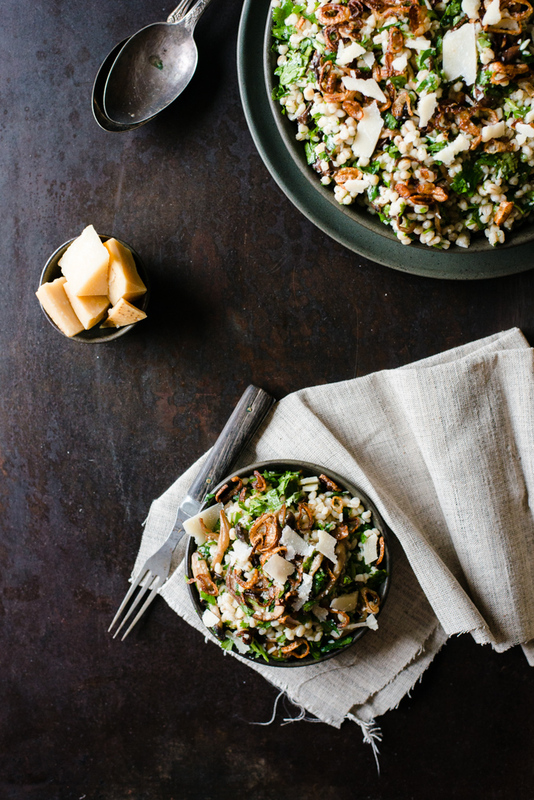 Serve topped with fried shallots, and shaved parmesan.